Most form controls have a value and a checkedness. (The latter is only used by input elements.) These are used to describe how the user interacts with the control. A control's value is its internal state. As such, it might not match the user's current input. For instance, if a user enters the word "three" into a numeric field that expects digits, the user's input would be the string "three" but the control's value would remain unchanged. Or, if a user enters the email address " awesome@example.com" (with leading whitespace) into an email field, the user's input would be the string " awesome@example.com" but the browser's UI for email fields might translate that into a value of "awesome@example.com" (without the leading whitespace). input and textarea elements have a dirty value flag. This is used to track the interaction between the value and default value. If it is false, value mirrors the default value. If it is true, the default value is ignored. To define the behavior of constraint validation in the face of the input element's multiple attribute, input elements can also have separately defined values. To define the behavior of the maxlength and minlength attributes, as well as other APIs specific to the textarea element, all form control with a value also have an algorithm for obtaining an API value. By default this algorithm is to simply return the control's value. The select element does not have a value; the selectedness of its option elements is what is used instead. A form control can be designated as mutable. This determines (by means of definitions and requirements in this specification that rely on whether an element is so designated) whether or not the user can modify the value or checkedness of a form control, or whether or not a control can be automatically prefilled. A form-associated element has an associated parser inserted flag. A form-associated element is, by default, associated with its nearest ancestor form element (as described below), but, if it is listed, may have a form attribute specified to override this. If a listed form-associated element has a form attribute specified, then that attribute's value must be the ID of a form element in the element's tree. The rules in this section are complicated by the fact that although conforming documents or trees will never contain nested form elements, it is quite possible (e.g., using a script that performs DOM manipulation) to generate trees that have such nested elements. They are also complicated by rules in the HTML parser that, for historical reasons, can result in a form-associated element being associated with a form element that is not its ancestor. If the form-associated element's parser inserted flag is set, then return. Reset the form owner of the form-associated element. If the form-associated element has a form owner and the form-associated element and its form owner are no longer in the same tree, then reset the form owner of the form-associated element. When a listed form-associated element's form attribute is set, changed, or removed, then the user agent must reset the form owner of that element. When a listed form-associated element has a form attribute and the ID of any of the elements in the tree changes, then the user agent must reset the form owner of that form-associated element. When a listed form-associated element has a form attribute and an element with an ID is inserted into or removed from the Document, then the user agent must reset the form owner of that form-associated element. Unset element's parser inserted flag. then do nothing, and return. Set element's form owner to null. If the first element in element's tree, in tree order, to have an ID that is case-sensitively equal to element's form content attribute's value, is a form element, then associate the element with that form element. Otherwise, if element has an ancestor form element, then associate element with the nearest such ancestor form element. This example is a non-conforming document, though, as it is a violation of the content models to nest form elements, and there is a parse error for the </form> tag. Listed form-associated elements have a form IDL attribute, which, on getting, must return the element's form owner, or null if there isn't one. The name content attribute gives the name of the form control, as used in form submission and in the form element's elements object. If the attribute is specified, its value must not be the empty string or isindex. A number of user agents historically implemented special support for first-in-form text controls with the name isindex, and this specification previously defined related user agent requirements for it. However, some user agents subsequently dropped that special support, and the related requirements were removed from this specification. So, to avoid problematic reinterpretations in legacy user agents, the name isindex is no longer allowed. Other than isindex, any non-empty value for name is allowed. The name _charset_ is special: if used as the name of a Hidden control with no value attribute, then during submission the value attribute is automatically given a value consisting of the submission character encoding. DOM clobbering is a common cause of security issues. Avoid using the names of built-in form properties with the name content attribute. The dirname attribute on a form control element enables the submission of the directionality of the element, and gives the name of the control that contains this value during form submission. If such an attribute is specified, its value must not be the empty string. In the case of textarea elements, the API value and value differ. In particular, newline normalization is applied before the maximum allowed value length is checked (whereas the textarea wrapping transformation is not applied). The minlength attribute does not imply the required attribute. If the form control has no required attribute, then the value can still be omitted; the minlength attribute only kicks in once the user has entered a value at all. If the empty string is not allowed, then the required attribute also needs to be set. If an element has its form control minlength attribute specified, the attribute's value must be a valid non-negative integer. If the attribute is specified and applying the rules for parsing non-negative integers to its value results in a number, then that number is the element's minimum allowed value length. If the attribute is omitted or parsing its value results in an error, then there is no minimum allowed value length. If an element has both a maximum allowed value length and a minimum allowed value length, the minimum allowed value length must be smaller than or equal to the maximum allowed value length. In this example, there are four text controls. The first is required, and has to be at least 5 characters long. The other three are optional, but if the user fills one in, the user has to enter at least 10 characters. The disabled attribute for option elements and the disabled attribute for optgroup elements are defined separately. The element is a button, input, select, or textarea element, and the disabled attribute is specified on this element (regardless of its value). The element is a descendant of a fieldset element whose disabled attribute is specified, and is not a descendant of that fieldset element's first legend element child, if any. A form control that is disabled must prevent any click events that are queued on the user interaction task source from being dispatched on the element. Constraint validation: If an element is disabled, it is barred from constraint validation. The keyword dialog, mapping to the state dialog, indicating that submitting the form is intended to close the dialog box in which the form finds itself, if any, and otherwise not submit. In this example, a form is used with a dialog. The method attribute's "dialog" keyword is used to have the dialog automatically close when the form is submitted. The action IDL attribute must reflect the content attribute of the same name, except that on getting, when the content attribute is missing or its value is the empty string, the element's node document's URL must be returned instead. The target IDL attribute must reflect the content attribute of the same name. The method and enctype IDL attributes must reflect the respective content attributes of the same name, limited to only known values. The encoding IDL attribute must reflect the enctype content attribute, limited to only known values. The noValidate IDL attribute must reflect the novalidate content attribute. The formAction IDL attribute must reflect the formaction content attribute, except that on getting, when the content attribute is missing or its value is the empty string, the element's node document's URL must be returned instead. The formEnctype IDL attribute must reflect the formenctype content attribute, limited to only known values. The formMethod IDL attribute must reflect the formmethod content attribute, limited to only known values. The formNoValidate IDL attribute must reflect the formnovalidate content attribute. The formTarget IDL attribute must reflect the formtarget content attribute. The autofocus content attribute allows the author to indicate that a control is to be focused as soon as the page is loaded or as soon as the dialog within which it finds itself is shown, allowing the user to just start typing without having to manually focus the main control. An element's nearest ancestor autofocus scoping root element is the element itself if the element is a dialog element, or else is the element's nearest ancestor dialog element, if any, or else is the element's last inclusive ancestor element. There must not be two elements with the same nearest ancestor autofocus scoping root element that both have the autofocus attribute specified. If the user has indicated (for example, by starting to type in a form control) that they do not wish focus to be changed, then optionally return. Let target be the element's node document. If target's browsing context is null, then return. If target's active sandboxing flag set has the sandboxed automatic features browsing context flag, then return. If target's origin is not the same as the origin of the node document of the currently focused element in target's top-level browsing context, then return. If target's origin is not the same as the origin of the active document of target's top-level browsing context, then return. If the user agent has already reached the last step of this list of steps in response to an element being inserted into a Document whose top-level browsing context's active document is the same as target's top-level browsing context's active document, then return. Run the focusing steps for the element. User agents may also change the scrolling position of the document, or perform some other action that brings the element to the user's attention. This handles the automatic focusing during document load. The show() and showModal() methods of dialog elements also processes the autofocus attribute. Focusing the control does not imply that the user agent has to focus the browser window if it has lost focus. User agents sometimes have features for helping users fill forms in, for example prefilling the user's address based on earlier user input. The autocomplete content attribute can be used to hint to the user agent how to, or indeed whether to, provide such a feature. There are two ways this attribute is used. When wearing the autofill expectation mantle, the autocomplete attribute describes what input is expected from users. When wearing the autofill anchor mantle, the autocomplete attribute describes the meaning of the given value. On an input element whose type attribute is in the Hidden state, the autocomplete attribute wears the autofill anchor mantle. In all other cases, it wears the autofill expectation mantle. When wearing the autofill expectation mantle, the autocomplete attribute, if specified, must have a value that is an ordered set of space-separated tokens consisting of either a single token that is an ASCII case-insensitive match for the string "off", or a single token that is an ASCII case-insensitive match for the string "on", or autofill detail tokens. When wearing the autofill anchor mantle, the autocomplete attribute, if specified, must have a value that is an ordered set of space-separated tokens consisting of just autofill detail tokens (i.e. the "on" and "off" keywords are not allowed). Optionally, a token whose first eight characters are an ASCII case-insensitive match for the string "section-", meaning that the field belongs to the named group. As noted earlier, the meaning of the attribute and its keywords depends on the mantle that the attribute is wearing. The "off" keyword indicates either that the control's input data is particularly sensitive (for example the activation code for a nuclear weapon); or that it is a value that will never be reused (for example a one-time-key for a bank login) and the user will therefore have to explicitly enter the data each time, instead of being able to rely on the UA to prefill the value for them; or that the document provides its own autocomplete mechanism and does not want the user agent to provide autocompletion values. The "on" keyword indicates that the user agent is allowed to provide the user with autocompletion values, but does not provide any further information about what kind of data the user might be expected to enter. User agents would have to use heuristics to decide what autocompletion values to suggest. The autofill field listed above indicate that the user agent is allowed to provide the user with autocompletion values, and specifies what kind of value is expected. The meaning of each such keyword is described in the table below. The autofill field listed above indicate that the value of the particular kind of value specified is that value provided for this element. The meaning of each such keyword is described in the table below. In this example the page has explicitly specified the currency and amount of the transaction. The form requests a credit card and other billing details. The user agent could use this information to suggest a credit card that it knows has sufficient balance and that supports the relevant currency. The autofill field keywords relate to each other as described in the table below. Each field name listed on a row of this table corresponds to the meaning given in the cell for that row in the column labeled "Meaning". Some fields correspond to subparts of other fields; for example, a credit card expiry date can be expressed as one field giving both the month and year of expiry ("cc-exp"), or as two fields, one giving the month ("cc-exp-month") and one the year ("cc-exp-year"). In such cases, the names of the broader fields cover multiple rows, in which the narrower fields are defined. Generally, authors are encouraged to use the broader fields rather than the narrower fields, as the narrower fields tend to expose Western biases. For example, while it is common in some Western cultures to have a given name and a family name, in that order (and thus often referred to as a first name and a surname), many cultures put the family name first and the given name second, and many others simply have one name (a mononym). Having a single field is therefore more flexible. Some fields are only appropriate for certain form controls. An autofill field name is inappropriate for a control if the control does not belong to the group listed for that autofill field in the fifth column of the first row describing that autofill field in the table below. What controls fall into each group is described below the table. Address levels: The "address-level1" – "address-level4" fields are used to describe the locality of the street address. Different locales have different numbers of levels. For example, the US uses two levels (state and town), the UK uses one or two depending on the address (the post town, and in some cases the locality), and China can use three (province, city, district). The "address-level1" field represents the widest administrative division. Different locales order the fields in different ways; for example, in the US the town (level 2) precedes the state (level 1); while in Japan the prefecture (level 1) precedes the city (level 2) which precedes the district (level 3). 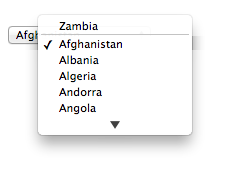 Authors are encouraged to provide forms that are presented in a way that matches the country's conventions (hiding, showing, and rearranging fields accordingly as the user changes the country). Each input element to which the autocomplete attribute applies, each select element, and each textarea element, has an autofill hint set, an autofill scope, an autofill field name, and an IDL-exposed autofill value. The autofill field name specifies the specific kind of data expected in the field, e.g. "street-address" or "cc-exp". The autofill hint set identifies what address or contact information type the user agent is to look at, e.g. "shipping fax" or "billing". The autofill scope identifies the group of fields whose information concerns the same subject, and consists of the autofill hint set with, if applicable, the "section-*" prefix, e.g. "billing", "section-parent shipping", or "section-child shipping home". If the element has no autocomplete attribute, then jump to the step labeled default. Let tokens be the result of splitting the attribute's value on ASCII whitespace. If tokens is empty, then jump to the step labeled default. Let index be the index of the last token in tokens. If the indexth token in tokens is not an ASCII case-insensitive match for one of the tokens given in the first column of the following table, or if the number of tokens in tokens is greater than the maximum number given in the cell in the second column of that token's row, then jump to the step labeled default. Otherwise, let field be the string given in the cell of the first column of the matching row, and let category be the value of the cell in the third column of that same row. If category is Off or Automatic but the element's autocomplete attribute is wearing the autofill anchor mantle, then jump to the step labeled default. If category is Off, let the element's autofill field name be the string "off", let its autofill hint set be empty, and let its IDL-exposed autofill value be the string "off". Then, return. If category is Automatic, let the element's autofill field name be the string "on", let its autofill hint set be empty, and let its IDL-exposed autofill value be the string "on". Then, return. Let scope tokens be an empty list. Let hint tokens be an empty set. Let IDL value have the same value as field. If the indexth token in tokens is the first entry, then skip to the step labeled done. Let contact be the matching string from the list above. Insert contact at the start of scope tokens. Add contact to hint tokens. Let IDL value be the concatenation of contact, a U+0020 SPACE character, and the previous value of IDL value (which at this point will always be field). If the indexth entry in tokens is the first entry, then skip to the step labeled done. Let mode be the matching string from the list above. Insert mode at the start of scope tokens. Add mode to hint tokens. Let IDL value be the concatenation of mode, a U+0020 SPACE character, and the previous value of IDL value (which at this point will either be field or the concatenation of contact, a space, and field). If the indexth entry in tokens is not the first entry, then jump to the step labeled default. If the first eight characters of the indexth token in tokens are not an ASCII case-insensitive match for the string "section-", then jump to the step labeled default. Let section be the indexth token in tokens, converted to ASCII lowercase. Insert section at the start of scope tokens. Let IDL value be the concatenation of section, a U+0020 SPACE character, and the previous value of IDL value. Done: Let the element's autofill hint set be hint tokens. Let the element's autofill scope be scope tokens. Let the element's autofill field name be field. Let the element's IDL-exposed autofill value be IDL value. Default: Let the element's IDL-exposed autofill value be the empty string, and its autofill hint set and autofill scope be empty. If the element's autocomplete attribute is wearing the autofill anchor mantle, then let the element's autofill field name be the empty string and return. Let form be the element's form owner, if any, or null otherwise. If form is not null and form's autocomplete attribute is in the off state, then let the element's autofill field name be "off". Otherwise, let the element's autofill field name be "on". The option elements in the select element's list of options that have their selectedness set to true. The option element in the select element's list of options that has its selectedness set to true. How to process the autofill hint set, autofill scope, and autofill field name depends on the mantle that the autocomplete attribute is wearing. When an element's autofill field name is "off", the user agent should not remember the control's data, and should not offer past values to the user. In addition, when an element's autofill field name is "off", values are reset when traversing the history. When an element's autofill field name is not "off", the user agent may store the control's data, and may offer previously stored values to the user. When the autofill field name is "on", the user agent should attempt to use heuristics to determine the most appropriate values to offer the user, e.g. based on the element's name value, the position of the element in its tree, what other fields exist in the form, and so forth. When the autofill field name is one of the names of the autofill fields described above, the user agent should provide suggestions that match the meaning of the field name as given in the table earlier in this section. The autofill hint set should be used to select amongst multiple possible suggestions. For example, if a user once entered one address into fields that used the "shipping" keyword, and another address into fields that used the "billing" keyword, then in subsequent forms only the first address would be suggested for form controls whose autofill hint set contains the keyword "shipping". Both addresses might be suggested, however, for address-related form controls whose autofill hint set does not contain either keyword. When the autofill field name is not the empty string, then the user agent must act as if the user had specified the control's data for the given autofill hint set, autofill scope, and autofill field name combination. When the user agent autofills form controls, elements with the same form owner and the same autofill scope must use data relating to the same person, address, payment instrument, and contact details. When a user agent autofills "country" and "country-name" fields with the same form owner and autofill scope, and the user agent has a value for the country" field(s), then the "country-name" field(s) must be filled using a human-readable name for the same country. When a user agent fills in multiple fields at once, all fields with the same autofill field name, form owner and autofill scope must be filled with the same value. Suppose a user agent knows of two phone numbers, +1 555 123 1234 and +1 555 666 7777. It would not be conforming for the user agent to fill a field with autocomplete="shipping tel-local-prefix" with the value "123" and another field in the same form with autocomplete="shipping tel-local-suffix" with the value "7777". The only valid prefilled values given the aforementioned information would be "123" and "1234", or "666" and "7777", respectively. Similarly, if a form for some reason contained both a "cc-exp" field and a "cc-exp-month" field, and the user agent prefilled the form, then the month component of the former would have to match the latter. The only value that a conforming user agent could suggest in the text control is "TreePlate", the value given by the hidden input element. The "section-*" tokens in the autofill scope are opaque; user agents must not attempt to derive meaning from the precise values of these tokens. For example, it would not be conforming if the user agent decided that it should offer the address it knows to be the user's daughter's address for "section-child" and the addresses it knows to be the user's spouses' addresses for "section-spouse". The autocompletion mechanism must be implemented by the user agent acting as if the user had modified the control's data, and must be done at a time where the element is mutable (e.g. just after the element has been inserted into the document, or when the user agent stops parsing). User agents must only prefill controls using values that the user could have entered. For example, if a select element only has option elements with values "Steve" and "Rebecca", "Jay", and "Bob", and has an autofill field name "given-name", but the user agent's only idea for what to prefill the field with is "Evan", then the user agent cannot prefill the field. It would not be conforming to somehow set the select element to the value "Evan", since the user could not have done so themselves. A user agent prefilling a form control must not discriminate between form controls that are in a document tree and those that are connected; that is, it is not conforming to make the decision on whether or not to autofill based on whether the element's root is a shadow root versus a Document. A user agent prefilling a form control's value must not cause that control to suffer from a type mismatch, suffer from being too long, suffer from being too short, suffer from an underflow, suffer from an overflow, or suffer from a step mismatch. A user agent prefilling a form control's value must not cause that control to suffer from a pattern mismatch either. Where possible given the control's constraints, user agents must use the format given as canonical in the aforementioned table. Where it's not possible for the canonical format to be used, user agents should use heuristics to attempt to convert values so that they can be used. ...then the user agent could convert "Ines" to "I" and prefill it that way. July The user agent picks the month from the listed options, either by noticing there are twelve options and picking the 7th, or by recognizing that one of the strings (three characters "Jul" followed by a newline and a space) is a close match for the name of the month (July) in one of the user agent's supported languages, or through some other similar mechanism. 7 User agent converts "July" to a month number in the range 1..12, like the field. 6 User agent converts "July" to a month number in the range 0..11, like the field. User agent doesn't fill in the field, since it can't make a good guess as to what the form expects. A user agent may allow the user to override an element's autofill field name, e.g. to change it from "off" to "on" to allow values to be remembered and prefilled despite the page author's objections, or to always "off", never remembering values. More specifically, user agents may in particular consider replacing the autofill field name of form controls that match the description given in the first column of the following table, when their autofill field name is either "on" or "off", with the value given in the second cell of that row. If this table is used, the replacements must be done in tree order, since all but the first row references the autofill field name of earlier elements. When the descriptions below refer to form controls being preceded or followed by others, they mean in the list of listed elements that share the same form owner. an input element whose type attribute is in the Text state that is followed by an input element whose type attribute is in the Password state "username"
an input element whose type attribute is in the Password state that is preceded by an input element whose autofill field name is "username" "current-password"
an input element whose type attribute is in the Password state that is preceded by an input element whose autofill field name is "current-password" "new-password"
an input element whose type attribute is in the Password state that is preceded by an input element whose autofill field name is "new-password" "new-password"
The autocomplete IDL attribute, on getting, must return the element's IDL-exposed autofill value, and on setting, must reflect the content attribute of the same name. The input and textarea elements define several attributes and methods for handling their selection. Their shared algorithms are defined here. Selects everything in the text control. Returns the offset to the start of the selection. Can be set, to change the start of the selection. Returns the offset to the end of the selection. Can be set, to change the end of the selection. Returns the current direction of the selection. Can be set, to change the direction of the selection. The possible values are "forward", "backward", and "none". Changes the selection to cover the given substring in the given direction. If the direction is omitted, it will be reset to be the platform default (none or forward). Replaces a range of text with the new text. If the start and end arguments are not provided, the range is assumed to be the selection. All input elements to which these APIs apply, and all textarea elements, have either a selection or a text entry cursor position at all times (even for elements that are not being rendered). The initial state must consist of a text entry cursor at the beginning of the control. For input elements, these APIs must operate on the element's value. For textarea elements, these APIs must operate on the element's API value. In the below algorithms, we call the value string being operated on the relevant value. If we had operated on the raw value of "A\r\nB", then we would have replaced the characters "A\r", ending up with a result of "replaced\nB". But since we used the API value of "A\nB", we replaced the characters "A\n", giving "replacedB". If the start of the selection is now past the end of the relevant value, set it to the end of the relevant value. If the end of the selection is now past the end of the relevant value, set it to the end of the relevant value. If the user agent does not support empty selection, and both the start and end of the selection are now pointing to the end of the relevant value, then instead set the element's text entry cursor position to the end of the relevant value, removing any selection. Otherwise, the element must have a text entry cursor position position. If it is now past the end of the relevant value, set it to the end of the relevant value. In some cases where the relevant value changes, other parts of the specification will also modify the text entry cursor position, beyond just the clamping steps above. For example, see the value setter for textarea. Characters with no visible rendering, such as U+200D ZERO WIDTH JOINER, still count as characters. Thus, for instance, the selection can include just an invisible character, and the text insertion cursor can be placed to one side or another of such a character. Where possible, user interface features for changing the text selection in input and textarea elements must be implemented using the set the selection range algorithm so that, e.g., all the same events fire. The selections of input and textarea elements have a selection direction, which is either "forward", "backward", or "none". This direction is set when the user manipulates the selection. The exact meaning of the selection direction depends on the platform. To set the selection direction of an element to a given direction, update the element's selection direction to the given direction, unless the direction is "none" and the platform does not support that direction; in that case, update the element's selection direction to "forward". On Windows, the direction indicates the position of the caret relative to the selection: a "forward" selection has the caret at the end of the selection and a "backward" selection has the caret at the start of the selection. Windows has no "none" direction. On Mac, the direction indicates which end of the selection is affected when the user adjusts the size of the selection using the arrow keys with the Shift modifier: the "forward" direction means the end of the selection is modified, and the "backward" direction means the start of the selection is modified. The "none" direction is the default on Mac, it indicates that no particular direction has yet been selected. The user sets the direction implicitly when first adjusting the selection, based on which directional arrow key was used. If this element is an input element, and either select() does not apply to this element or the corresponding control has no selectable text, return. For instance, in a user agent where <input type=color> is rendered as a color well with a picker, as opposed to a text control accepting a hexadecimal color code, there would be no selectable text, and thus calls to the method are ignored. Set the selection range with 0 and infinity. If this element is an input element, and selectionStart does not apply to this element, return null. If there is no selection, return the offset (in logical order) within the relevant value to the character that immediately follows the text entry cursor. Return the offset (in logical order) within the relevant value to the character that immediately follows the start of the selection. If this element is an input element, and selectionStart does not apply to this element, throw an "InvalidStateError" DOMException. Let end be the value of this element's selectionEnd attribute. If end is less than the given value, set end to the given value. Set the selection range with the given value, end, and the value of this element's selectionDirection attribute. If this element is an input element, and selectionEnd does not apply to this element, return null. Return the offset (in logical order) within the relevant value to the character that immediately follows the end of the selection. If this element is an input element, and selectionEnd does not apply to this element, throw an "InvalidStateError" DOMException. Set the selection range with the value of this element's selectionStart attribute, the given value, and the value of this element's selectionDirection attribute. If this element is an input element, and selectionDirection does not apply to this element, return null. Return this element's selection direction. If this element is an input element, and selectionDirection does not apply to this element, throw an "InvalidStateError" DOMException. Set the selection range with the value of this element's selectionStart attribute, the value of this element's selectionEnd attribute, and the given value. If this element is an input element, and setSelectionRange() does not apply to this element, throw an "InvalidStateError" DOMException. Set the selection range with start, end, and direction. If start is null, let start be zero. If end is null, let end be zero. Set the selection of the text control to the sequence of characters within the relevant value starting with the character at the startth position (in logical order) and ending with the character at the (end-1)th position. Arguments greater than the length of the relevant value of the text control (including the special value infinity) must be treated as pointing at the end of the text control. If end is less than or equal to start then the start of the selection and the end of the selection must both be placed immediately before the character with offset end. In UAs where there is no concept of an empty selection, this must set the cursor to be just before the character with offset end. If direction is not a case-sensitive match for either the string "backward" or "forward", or if the direction argument was omitted, set direction to "none". Set the selection direction of the text control to direction. If the previous steps caused the selection of the text control to be modified (in either extent or direction), then queue a task, using the user interaction task source, to fire an event named select at the element, with the bubbles attribute initialized to true. If this element is an input element, and setRangeText() does not apply to this element, throw an "InvalidStateError" DOMException. Set this element's dirty value flag to true. If the method has only one argument, then let start and end have the values of the selectionStart attribute and the selectionEnd attribute respectively. Otherwise, let start, end have the values of the second and third arguments respectively. If start is greater than end, then throw an "IndexSizeError" DOMException. If start is greater than the length of the relevant value of the text control, then set it to the length of the relevant value of the text control. If end is greater than the length of the relevant value of the text control, then set it to the length of the relevant value of the text control. Let selection start be the current value of the selectionStart attribute. Let selection end be the current value of the selectionEnd attribute. If start is less than end, delete the sequence of characters within the element's relevant value starting with the character at the startth position (in logical order) and ending with the character at the (end-1)th position. Insert the value of the first argument into the text of the relevant value of the text control, immediately before the startth character. Let new length be the length of the value of the first argument. Let new end be the sum of start and new length. If the fourth argument's value is "select"
Let selection start be start. Let selection end be new end. If the fourth argument's value is "start"
Let selection start and selection end be start. If the fourth argument's value is "end"
Let selection start and selection end be new end. If the fourth argument's value is "preserve"
Let old length be end minus start. Let delta be new length minus old length. If selection end is greater than end, then increment it by delta in the same way. Set the selection range with selection start and selection end. ...where control is the input or textarea element. When a control has no value but has a required attribute (input required, textarea required); or, more complicated rules for select elements and controls in radio button groups, as specified in their sections. When a control has a value that is too short for the form control minlength attribute (input minlength, textarea minlength). When a control has a value that is not the empty string and is too low for the min attribute. When a control has a value that is not the empty string and is too high for the max attribute. When a control has incomplete input and the user agent does not think the user ought to be able to submit the form in its current state. If invalid controls is empty, then return a positive result. Let notCanceled be the result of firing an event named invalid at field, with the cancelable attribute initialized to true. If notCanceled is true, then add field to unhandled invalid controls. If the result was positive, then return that result. Returns true if the element's value, if it is not the empty string, is shorter than the provided minimum length; false otherwise. Returns true if the user has provided input in the user interface that the user agent is unable to convert to a value; false otherwise. Returns true if the element's value has no validity problems; otherwise, returns false, fires an invalid event at the element, and (if the event isn't canceled) reports the problem to the user. The willValidate attribute's getter must return true, if this element is a candidate for constraint validation, and false otherwise (i.e., false if any conditions are barring it from constraint validation). The setCustomValidity(message) method, when invoked, must set the custom validity error message to message. The validity attribute's getter must return a ValidityState object that represents the validity states of this element. This object is live. The control is suffering from being too short. The control is suffering from bad input. Fire an event named invalid at this element, with the cancelable attribute initialized to true (though canceling has no effect). Let report be the result of firing an event named invalid at this element, with the cancelable attribute initialized to true. If report is true, then report the problems with the constraints of this element to the user. When reporting the problem with the constraints to the user, the user agent may run the focusing steps for this element, and may change the scrolling position of the document, or perform some other action that brings this element to the user's attention. User agents may report more than one constraint violation, if this element suffers from multiple problems at once. If this element is not being rendered, then the user agent may, instead of notifying the user, report the error for the running script. If this element is not a candidate for constraint validation or if this element satisfies its constraints, then return the empty string. Return a suitably localized message that the user agent would show the user if this were the only form control with a validity constraint problem. If the user agent would not actually show a textual message in such a situation (e.g., it would show a graphical cue instead), then return a suitably localized message that expresses (one or more of) the validity constraint(s) that the control does not satisfy. If the element is a candidate for constraint validation and is suffering from a custom error, then the custom validity error message should be present in the return value. If the user agent supports letting the user submit a form implicitly (for example, on some platforms hitting the "enter" key while a text control is focused implicitly submits the form), then doing so for a form, whose default button has activation behavior and is not disabled, must cause the user agent to fire a click event at that default button. Each form element has a constructing entry list boolean, initially false. If form cannot navigate, then return. If form's constructing entry list is true, then return. Let form document be form's node document. If form document's active sandboxing flag set has its sandboxed forms browsing context flag set, then return. If the submitted from submit() method flag is not set, and the submitter element's no-validate state is false, then interactively validate the constraints of form and examine the result: if the result is negative (the constraint validation concluded that there were invalid fields and probably informed the user of this) then fire an event named invalid at the form element and then return. Let continue be the result of firing an event named submit at form, with the bubbles attribute initialized to true and the cancelable attribute initialized to true. If continue is false, then return. Cannot navigate is run again as dispatching the submit event could have changed the outcome. Let encoding be the result of picking an encoding for the form. Let entry list be the result of constructing the entry list with form, submitter, and encoding. Cannot navigate is run again as dispatching the formdata event in constructing the entry list could have changed the outcome. If action is the empty string, let action be the URL of the form document. Parse the URL action, relative to the submitter element's node document. If this fails, return. Let parsed action be the resulting URL record. Let scheme be the scheme of parsed action. Let target be the submitter element's formtarget attribute value, if the element is a submit button and has such an attribute. Otherwise, let it be the result of getting an element's target given submitter's form owner. Let noopener be the result of getting an element's noopener with form and targetAttributeValue. Let target browsing context and replace be the result of applying the rules for choosing a browsing context using target, form browsing context, and noopener. If target browsing context is null, then return. If form document has not yet completely loaded and the submitted from submit() method flag is set, then set replace to true. If destination is not a request, then set destination to a new request whose URL is destination. If the form element's link types include the noreferrer keyword, then set destination's referrer to "no-referrer". If the form has a non-null planned navigation, remove it from its task queue. Let the form's planned navigation be null. For the purposes of this task, target browsing context and replace are the variables that were set up when the overall form submission algorithm was run, with their values as they stood when this planned navigation was queued. Queue the task that is the form's new planned navigation. Let query be the result of running the application/x-www-form-urlencoded serializer with entry list and encoding. Set parsed action's query component to query. Plan to navigate to parsed action. Let body be the result of running the application/x-www-form-urlencoded serializer with entry list and encoding. Set body to the result of encoding body. Let body be the result of running the multipart/form-data encoding algorithm with entry list and encoding. Let body be the result of running the text/plain encoding algorithm with entry list. Set body to the result of encoding body using encoding. Plan to navigate to a new request whose url is parsed action, method is method, header list consists of `Content-Type`/MIME type, and body is body. Let headers be the result of running the application/x-www-form-urlencoded serializer with entry list and encoding. Set parsed action's query to headers. If parsed action's query is null, then set it to the empty string. If parsed action's query is not the empty string, then append a single U+0026 AMPERSAND character (&) to it. Append "body=" to parsed action's query. Append body to parsed action's query. Let subject be the nearest ancestor dialog element of form, if any. If submitter is an input element whose type attribute is in the Image Button state, then let result be the string formed by concatenating the selected coordinate's x-component, expressed as a base-ten number using ASCII digits, a U+002C COMMA character (,), and the selected coordinate's y-component, expressed in the same way as the x-component. Then, close the dialog subject. If there is a result, let that be the return value. The algorithm to construct the entry list given a form, an optional submitter, and an optional encoding, is as follows. If not specified otherwise, submitter is null. If form's constructing entry list is true, then return null. Set form's constructing entry list to true. Let entry list be a new empty list of entries. Append an entry to entry list with namex and x.
Append an entry to entry list with namey and y. If the field element is a select element, then for each option element in the select element's list of options whose selectedness is true and that is not disabled, append an entry to entry list with name and the value of the option element. Append an entry to entry list with name and value. If there are no selected files, then append an entry to entry list with name and a new File object with an empty name, application/octet-stream as type, and an empty body. Otherwise, for each file in selected files, append an entry to entry list with name and a File object representing the file. Otherwise, if the field element is an object element: try to obtain a form submission value from the plugin, and if that is successful, append an entry to entry list with name and the returned form submission value. Let charset be the name of encoding if encoding is given, and "UTF-8" otherwise. Append an entry to entry list with name and charset. Otherwise, if the field element is a textarea element, append an entry to entry list with name and the value of the field element, and the prevent line break normalization flag set. In the case of the value of textarea elements, the line break normalization is already performed during the conversion of the control's raw value into the control's value (which also performs any necessary line wrapping). Otherwise, append an entry to entry list with name and the value of the field element. Let dir be the string "ltr" if the directionality of the element is 'ltr', and "rtl" otherwise (i.e., when the directionality of the element is 'rtl'). Append an entry to entry list with dirname and dir. Let form data be a new FormData object associated with entry list. Fire an event named formdata at form using FormDataEvent, with the formData attribute initialized to form data and the bubbles attribute initialized to true. Set form's constructing entry list to false. Return a clone of entry list. For name, replace every occurrence of U+000D (CR) not followed by U+000A (LF), and every occurrence of U+000A (LF) not preceded by U+000D (CR), by a string consisting of a U+000D (CR) and U+000A (LF). Replace name with the result of converting to a sequence of Unicode scalar values. If the prevent line break normalization flag is unset, then replace every occurrence of U+000D (CR) not followed by U+000A (LF), and every occurrence of U+000A (LF) not preceded by U+000D (CR) in value, by a string consisting of a U+000D (CR) and U+000A (LF). Replace value with the result of converting to a sequence of Unicode scalar values. Create an entry with name and value, and append it to entry list. Let encoding be the document's character encoding. Let input be the value of the form element's accept-charset attribute. Let candidate encoding labels be the result of splitting input on ASCII whitespace. Let candidate encodings be an empty list of character encodings. For each token in candidate encoding labels in turn (in the order in which they were found in input), get an encoding for the token and, if this does not result in failure, append the encoding to candidate encodings. If candidate encodings is empty, return UTF-8. Return the first encoding in candidate encodings. Return the result of getting an output encoding from encoding. For each character in the entry's name and value that cannot be expressed using the selected character encoding, replace the character by a string consisting of a U+0026 AMPERSAND character (&), a U+0023 NUMBER SIGN character (#), one or more ASCII digits representing the code point of the character in base ten, and finally a U+003B (;). Each entry in entry list is a field, the name of the entry is the field name and the value of the entry is the field value. The order of parts must be the same as the order of fields in entry list. Multiple entries with the same name must be treated as distinct fields. The parts of the generated multipart/form-data resource that correspond to non-file fields must not have a `Content-Type` header specified. Their names and values must be encoded using the character encoding selected above. File names included in the generated multipart/form-data resource (as part of file fields) must use the character encoding selected above, though the precise name may be approximated if necessary (e.g. newlines could be removed from file names, quotes could be changed to "%22", and characters not expressible in the selected character encoding could be replaced by other characters). If the entry's value is a File object, then set its value to the File object's name. Returns a FormData object representing names and values of elements associated to the target form. Operations on the FormData object will affect form data to be submitted. The formData attribute must return the value it was initialized to. It represents a FormData object associated to the entry list that is constructed when the form is submitted. Let reset be the result of firing an event named reset at form, with the bubbles and cancelable attributes initialized to true. If reset is true, then invoke the reset algorithm of each resettable element whose form owner is form.